The major league opener is tonight, when Houston and Texas meet on Sunday Night Baseball. It’s the only game today – almost everybody else plays Monday, including the Mariners. Here in Tacoma, we’re waiting for the Mariners to send us our opening day roster. I expect it on either Monday or Tuesday, and we’ll have it posted online as soon as we get it. There was one big news item yesterday, as far as the Rainiers are concerned: the Mariners released veteran catcher Ronny Paulino. This clears the way for Mike Zunino to play in Tacoma, with either Jesus Sucre or Brandon Bantz backing him up. Just as I was wrapping up this blog, Shannon Drayer reported on Twitter that it looks like Jeremy Bonderman is going to accept an assignment to Tacoma. Good news! The Mariners season preview articles came out today, so let’s hit the links. The Mariners-Rockies game yesterday was a big hit in Salt Lake City. Ryan Divish writes that the Mariners pitching staff is Felix Hernandez and a whole lot of question marks. Felix Hernandez isn’t worried – he thinks that the Mariners are going to be good. John McGrath took the persona of the Houston Astros and introduced himself to his new friends in the AL West. OK, that sounds weird, but trust me: it’s a terrific column. McGrath also answered questions about what is new in MLB for 2013. He predicts the Washington Nationals will win the whole ball of wax. Here is your one-stop-shop for the entire Seattle Times MLB/Mariners preview package. From that page you can read on a variety of subjects, including this piece on the Mariners farm system. Mariners infield prospect Brad Miller stayed in big league camp until the very end. Some ex-Rainiers notes, both good and bad: Rob Johnson was sent to Memphis, the Mets released Mike Wilson, Shawn Kelley made the Yankees opening day roster, and the Giants decided to carry three catchers in the majors – with the third one being Guillermo Quiroz. Opening Day, 1867. Base-ball matters. In the PCL, three teams announced their opening day rosters: the Omaha Storm Chasers, the Round Rock Express, and the Nashville Sounds. Here’s a look at the probable Fresno team Tacoma faces on Thursday. Bob Turley – one of the key members of the 1950s Yankees dynasty – passed away. His New York Times obituary contains some great baseball history. Just a quick reminder that the Rainiers Open House is tomorrow (Saturday), from 11:00 AM to 2:00 PM. There will be free samples of food from our new concessions group, Ivar’s Inc. I saw one more Rainiers spring training game, on Thursday. They lost to Tucson, 4-2. D.J. Mitchell started and went four innings, giving up a three-run homer to Tucson slugger Cody Decker. Decker went deep a again in the sixth inning, a solo shot off Brian Moran. Moran pitched two innings, allowing one run. Forrest Snow, George Mieses, and Logan Bawcom each pitched one scoreless inning. There wasn’t much offense for Tacoma. Alex Liddi homered off left-handed reliever Colt Hynes, and Jake Marder (not expected to be with Tacoma) had an RBI double. Tacoma had seven hits. Today the big league club packed up and left Arizona. They have an exhibition game on Saturday in Salt Lake City (Tacoma will be there in three weeks), and then they fly to Oakland to start the season on Monday. The Triple-A club will stay in Arizona until Wednesday, and then travel to Fresno to open the PCL season Thursday night. Good news for ex-Rainiers first baseman Mike Carp: he made the Red Sox opening day roster. Jason Bay has the edge for the final Mariners roster spot, Geoff Baker writes. John McGrath checked out the new Safeco Field video board. In the PCL, Round Rock landed two top-shelf prospects. Apparently Fresno really like Tacoma. They are televising ten games this season, and six of them are against the Rainiers. Weird. It seems to happen every spring, but this year more so than others. Right now the Mariners have too many upper-level players in their minor league camp. A Triple-A team can carry a max of 25 players, and there are about 35 players here who can make a legitimate claim that they should be one of the 25. This means that there are going to be some disappointed players reporting to Double-A Jackson – and there are going to be some even more disappointed players who are sent home without a job. The most impacted positions are starting pitcher (I have seven Triple-A starters listed right now, which is two too many), outfield (no room to promote anyone from Double-A, and the entire High Desert outfield from last year should be moved up to AA, causing a sandwich effect at Jackson), and catcher (Tacoma can’t carry Zunino, Paulino, Sucre and Bantz). The coaches – who are my friends – are tight-lipped about how this is going to be handled, which is the right thing when people’s jobs are at stake. In many cases decisions are made above Daren Brown and Dwight Bernard. Director of Player Development Chris Gwynn, the Mariners team of professional scouts, and sometimes even Jack Zduriencik will make final decisions on where minor league players will start the season. Opening Day in the PCL is one week from today (Tacoma opens at Fresno). The roster will be set before then – probably this weekend, or maybe Monday when the big league club begins play. The Triple-A squad will stay in Arizona until Wednesday, then fly to Fresno to begin PCL play. Today is my final day in Arizona, I fly home on Friday morning. I’ll be checking out the Mariners vs. Padres Triple-A game (Tacoma vs Tucson) at 1:00. I may not have time to post my thoughts on that game until I get home on Friday, due to a busy schedule today. Anyway, check back often – baseball season is upon us, and this blog will be updated on an (almost) daily basis. Ryan Divish has the news story on the Mariners setting the starting rotation. Larry Stone says that the Mariners have starting pitching depth in the minors. Yesterday the Mariners played the Dodgers, and it was Felix Hernandez vs. Clayton Kershaw. Would have been a marquee match-up if it wasn’t spring training. John McGrath has a column about some weird things that have happened this spring. The esteemed Tim Brown has an excellent column on former Rainiers pitcher Felix Hernandez. Over at Grantland, friend-of-the-blog Jonah Keri previewed the American League West. Here’s a post about baseball humidors and PCL park effects. It was intrasquad day today on the back fields of Mariners spring training camp, with a pair of 10:00 AM games pitting Mariners against Mariners, with little regard for the rules of baseball. Three outs in an inning? Not usually. A nine-man lineup? Nope. Batting out of turn? Encouraged! Here are some of my notes from the game – a game which was still going when I left, as the teams seemed to be playing an unlimited number of innings. Early today during a live radio interview with Mitch on KJR 950 AM, Mariners manager Eric Wedge said that catcher Mike Zunino will open the season in Tacoma. This will be fun! Erasmo Ramirez started and was on a strict pitch count. He did not look sharp, and it appeared he was limited to 15-to-20 pitches per “inning” – once he hit the number, the inning was declared over no matter how many outs there were. After the game, Ramirez was optioned to Tacoma. Ramirez did not help himself in the first inning, fielding a comebacker and throwing the ball into center field on a potential double play. The game was essentially a Triple-A versus Double-A match-up, except Ramirez started for the AA team, and Jackson starter Trevor Miller started for the AAA group. This way, the pitchers faced a more appropriate level of hitter. Vinnie Catricala had an eventful day, starting in left field. He dropped a routine fly ball with two outs, allowing runs to score. He missed a cutoff man. He also launched a three-run homer off Hector Noesi. In the end, I think he drove in more runs than he allowed. Speaking of Noesi, he had a very, very, very rough outing. The good news is there was no scoreboard, so we don’t know exactly how rough of an outing it was. 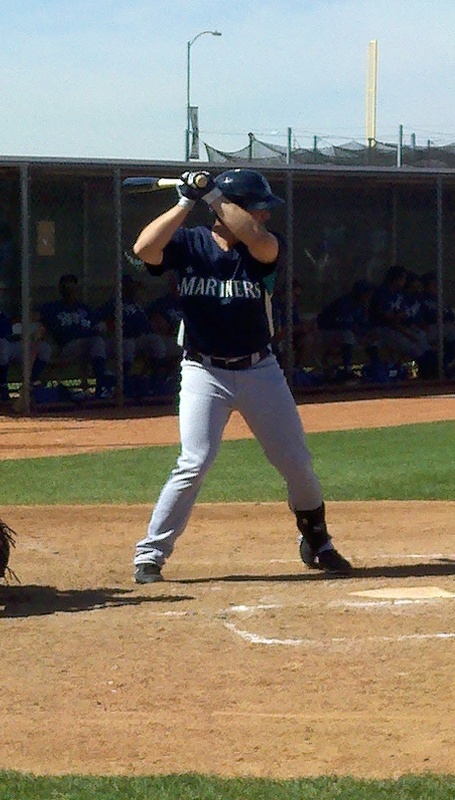 Potential Tacoma first baseman Rich Poythress continued to swing the bat, lining an opposite-field single off Ramirez. Rainiers lefty Brian Moran doesn’t just excel at pitching. He also has tremendous bat boy skills, which he displayed at Field 6. Scott Savastano saw a lot of time, making a nice play at third base charging a bunt, and contributing a hard RBI single which picked up speedy Eric Farris from second base. Left-handed reliever Nick Hill stood on a mound and threw baseballs to hitters in a live game. This is notable, because he was once somewhat of a prospect before injuries wiped out the last two complete seasons. If he’s healthy we could see him in Tacoma at some point. Infielder Nick Franklin has not played the last two days – I heard that he is nursing some sort of minor injury, perhaps a sprained ankle. I wandered over to the Class-A game for an inning, wanting a glimpse of rising prospect Gabriel Guerrero. He was instantly identifiable: even from 300 feet away when he is standing in right field, he looks just like his uncle Vladimir. Top prospect Victor Sanchez was pitching in the Class-A game. I’m not sure if he’s going to be the next CC Sabathia or the next Jumbo Diaz (photo). My point is that he is absolutely massive and not all in a good way. I promised Rainiers manager Daren Brown that I would repeat his joke, so here goes: when he saw how un-tan I am, he asked if I spent the off-season working in a paste factory. I don’t write the jokes, guys, I just repeat them. When I got to the big league press box, the Mariners announced their starting rotation: Felix, Iwakuma, Saunders, Maurer, and Beavan. Erasmo to Tacoma, and Jeremy Bonderman assigned to minor league camp. The media people are unsure if Bonderman is willing to accept an assignment to Tacoma. Tomorrow, I’ll watch Tacoma take on the Tucson Padres in my final taste of spring training baseball. A tough start in big league camp yesterday may have punched Jeremy Bonderman‘s ticket to Tacoma. Congratulations to popular former Rainiers star Matt Tuiasosopo, who has made the Detroit Tigers opening day roster. In this story: Tui is a daddy! I woke up at 5:00 AM today and caught the early flight down to Phoenix. I was on the ground at 10:10 (my second straight Alaska Airlines flight that landed considerably early – nice work, Alaska! ), in a rental car by 10:40, and pulling into the Mariners parking lot at the Peoria Sports Complex at 11:15. I stopped by the Mariners PR office, where Tim Hevly handed me a spiral-bound Mariners media guide and a spring training press pass. I made a quick stop by the media workroom, where reporters Greg Johns and Shannon Drayer were kind enough to tell me the fast way to get to the field in Surprise. Check into the hotel, grab an In ‘N’ Out Burger (double-double, fries, vanilla shake – sorry if you are reading this, Doc, I’ll try not to do it again this week but), and hit the road for the Rainiers game against Omaha on the back fields of the Royals complex. By the time I drove there, found the secret free parking lot, and walked to the field the game was already underway. As I approached the field, a large man in a Mariners jersey was finishing off his home run trot. I did not recognize this trotter – he was new to me. After saying hello to Tom Newberg, Dwight Bernard, and meeting Howard Johnson I learned that Mr. Home Run Guy was Rich Poythress, erstwhile Tacoma first baseman, and a man who is having a big spring training camp. I settled in and started watching some baseball while quickly getting a sunburn. Andrew Carraway started and coasted through the first two innings, but he gave up three runs in the third including a two-run homer to Chad Tracy. He got back on track and ended up going five full innings, allowing four runs and throwing roughly 80 pitches. I talked to Carraway when he was done, he said he’s just beginning to get stretched out as a starter now. Since he was invited to big league camp, his MLB appearances were no longer than two innings so he’s just now getting into the starting groove again. Brian Sweeney followed Carraway and tossed three super-quick routine innings. Sweeney said that he enjoyed playing for Team Italy in the World Baseball Classic, and that it presented a nice break from the spring training grind. The spring training grind – that was a theme. Everyone seems to be bemoaning how long this camp has been – it had an early start because of the WBC, and it seems to be going on forever. I suggested it was the longest spring training ever and Bernard (a baseball lifer) said “Nope! The year of the replacement players was longer.” He’s right. In the fourth inning, Carlos Peguero launched a big fly to left field off left-handed Omaha starter Ryan Verdugo for a solo homer. Oh yeah – ex-Rainiers star Adam Moore started at catcher for Omaha. In the 6th inning Mike Zunino came to the plate and I decided to try to take a picture. I was aiming my cell phone through a chain-link fence and low and behold I got two shots – of the same pitch, which he ripped to deep left-center for a double off of sometimes major-league reliever Brian Sanches. Click to enlarge the photos. Right before ripping the pitch to left-center. I posted the second picture on Twitter and was immediately asked if Zunino was going to start the year in Tacoma. We just don’t know yet – and probably won’t know until Sunday or Monday. Believe me, I’ll tell you as soon as I find out. The Rainiers lost the game, 4-2, but I wanted to point out three other highlights. Ronny Paulino hit a slicing line drive down the right field line – a ball that barely went foul. The lumbering Paulino was running it out and as he was headed toward first base Hector Noesi started yelling “Triple! Triple! Triple!” When the ball went foul, even Paulino was laughing. Hector Noesi, eternal optimist. Paulino has hit a grand total of three triples over the last seven years. Alex Liddi hit a screaming line drive off the very top of the fence in left-center field. It was probably the hardest-hit ball of the game, an absolute BB. He got a double out of it. The mysterious Yoervis Medina pitched the ninth inning and set down the side in order. I stood right behind the plate and could see the radar gun where Carraway and Noesi were charting pitches: Medina was 94-96 mph on the gun, with fantastic movement on his fastball – movement that pitching coach Dwight Bernard said may have been supplemented by the “awful baseballs.” With that kind of velocity, it’s easy to see why Medina is still on the Mariners 40-man roster. There was a bit of big news over on the other field. The Double-A game was being played on the next field over, and I wandered over and saw that Chance Ruffin not only started the game, but he pitched at least four innings. I asked some questions and it turns out it is true: Ruffin, who has been a short-reliever since his junior year of college, is being moved into the starting rotation for 2013. It is possible that he will be going to Double-A Jackson in order to make the conversion. Ruffin has not been a starter since his sophomore year of college, at the University of Texas. I like this idea: Ruffin had a few outings with Tacoma last season where he threw over 40 pitches, and he was able to maintain his low-90s velocity in those games. If he can do that for 100 pitches, and improve his complimentary pitches a bit, he’s got a shot at making this work. Sorry, no links today – I didn’t have time to do my baseball reading, due to travel. (Note: I actually did read a really good piece in the latest ESPN magazine on the airplane, about Joey Votto‘s approach to hitting. That’s worth tracking down). Tomorrow the Mariners minor leaguers have a “camp day” and I’ll have a report on it in the afternoon. There was an unexpected turn in the composition of the Tacoma Rainiers roster over the weekend. 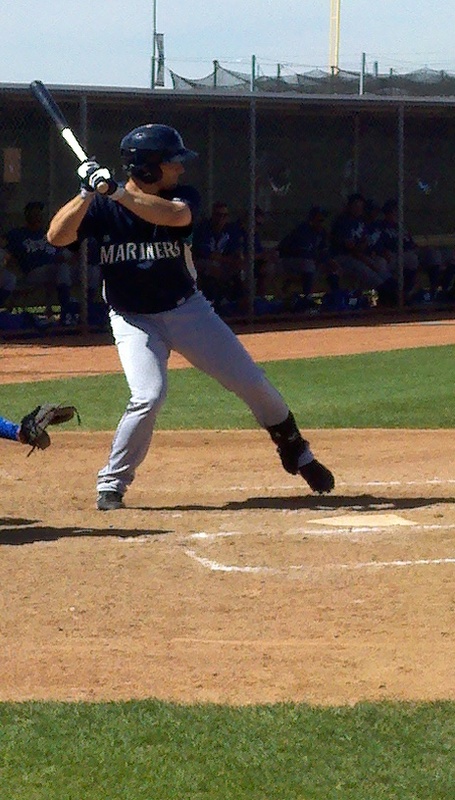 The Mariners announced that veteran first baseman Mike Jacobs asked to be released, and the Mariners agreed. So Jacobs – who I expected to start at first base and bat in the middle of the lineup – is out of the picture. Just as I was contemplating how this would change the team, the Mariners announced that they had signed veteran outfielder Endy Chavez to a minor league deal. In a news story (linked below), Chavez said that he expects to open the season in Tacoma. The 35-year-old Chavez has a ton of big league experience (stats). He’s always been a defense-first outfielder, and I assume he can still hold his own out there in center field. That seems to be where he’ll be playing; we were previously looking at playing a Triple-A rookie in center field (either Abe Almonte or Denny Almonte). Unless I’m reading the tea leaves incorrectly, we’re looking at a Tacoma outfield of Eric Thames, Endy Chavez, and Carlos Peguero. First base could go two ways. Manager Daren Brown could run Vinnie Catricala and Alex Liddi through first base – although, as I have stated many times, I think that is a waste of Liddi’s defensive talents. Liddi is a good third baseman and it would be nice to see him actually play his best position. The other possibility is that longtime Double-A first baseman Rich Poythress could finally get promoted to Tacoma. Last year Poythress posted a huge on-base percentage (.404) but did not show much over-the-fence power (six HRs, although he did have 21 doubles in 303 at-bats). They’ve got a week to figure this out. I’m off to Peoria, Arizona early on Tuesday morning. I’ll be blogging daily from spring training for the remainder of the week, although the new updates will come at unusual times – I’m guessing late in the afternoon, or perhaps later in the evening. As usual we’ll have notifications of new posts going out via Facebook and Twitter. The Mariners could not commit a starting rotation spot to non-roster veteran Jon Garland, so he took advantage of his contract right to become a free agent. This helps clarify the Mariners starting rotation plans (a little bit). It appears that Erasmo Ramirez is not going to start for the Mariners and he may pitch from the bullpen. Outfielder Endy Chavez knows he is opening the season in Tacoma. New Mariners reliever Kameron Loe talked about how a sports psychologist has helped him. From Baseball America’s minor league transactions we learn that the Mariners released ten low-level minor leaguers. Veteran pitcher Nelson Figueroa lost to Reno in the Triple-A Baseball National Championship Game last year. This year, he’s going to play for Reno. Figueroa has 103 career Triple-A wins – pretty amazing, if you think about it. Many analysts have Texas Rangers infielder Jurickson Profar ranked as the top prospect in the minors. He may open the season in Round Rock. The Angels sent down eight players, which I mention here because these guys are going to be on our division rival the Salt Lake Bees. As long as I don’t have any flight delays, I’ll be at the Tacoma Rainiers vs. Omaha Storm Chasers game tomorrow in Surprise, Arizona. Surprise! Hoping to have a blog post up on that game sometime Tuesday evening. It’s decision time for the Seattle Mariners, as they have to make some moves with veteran pitchers who are hoping to make the team. Starting rotation candidate Jon Garland pitched well last night, lasting six innings and allowing two runs on five hits to a Cubs team that featured about six major leaguers in the lineup. Garland told the media he has an out in his contract that kicks in today. The Mariners must tell him if he’s making the big league team – and if the answer is no, he can become a free agent. We should expect some news this afternoon. Looking at the bullpen, it appears that veteran reliever Kameron Loe has locked up a spot. While the team has not announced that, they sent Loe’s last remaining competition (prospect Carson Smith) to minor league camp, which seems to indicate that Loe is on the club. Geoff Baker has that story. The team also made some roster moves with position players: outfielder Carlos Peguero was optioned to Tacoma, and infielder Nick Franklin was transferred to minor league camp. Both are slated for Tacoma. Peguero, of course, is going to crush PCL pitching. I think that Franklin will put up much better numbers in the PCL now that he has been around the league a little bit. We’re getting close to being able to pencil out a Tacoma opening day roster. I may take a stab at that next week, when I’m down in Arizona. Larry Stone – who is very wise – agrees with me. He thinks that the Mariners should go young with the starting rotation. Tracy Ringolsby wrote about possible Tacoma catcher Mike Zunino. Reliever Carter Capps is working on a new breaking ball. Double-A Jackson broadcaster Chris Harris is killing it with quality content from Mariners minor league spring training – check out his blog right here. This kid is going to out-blog me this year. Baseball Prospectus is going to lead the way in a publishing an updated version of one of the greatest baseball books. “Dollar Sign On The Muscle” – out of print since 1984 – will be updated and published in 2013. Have a great weekend, and make sure you catch a good case of March Madness – after all, tomorrow is National Corn Dog Day. You are currently browsing the Booth, Justice and the American Pastime blog archives for March, 2013.